'A girl called Johnny' was released in March 1983, as the first single from the album 'The Waterboys'. The song was a tribute to Patti Smith. It reached number 80 in the UK singles chart. I bought the single during an outdoor music festival. It turned out to be an Italian pressing. Always nice to buy foreign pressings, because they seem more worthwhile to me. 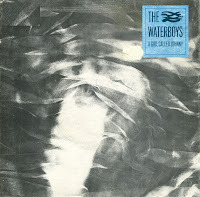 The Waterboys released 'The whole of the moon' in November 1985. It reached number 28 on the UK singles chart. It only reached number three in the chart after it was re-released in 1990. The song began as a 'scribble on the back of an envelope on a wintry New York street', after Mike Scott's girlfriend asked him if it was difficult to write a song, and was unfinished at the beginning of the recording sessions of the 1985 album 'This is the sea'. It was eventually completed in May 1985. In 1991, the song was awarded the prestigious Ivor Novello Award for songwriting and composing. 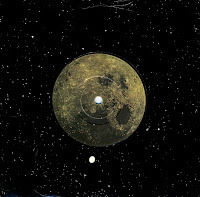 My copy of the single is housed in a black sleeve with a large hole in the middle, representing space, whereas the label of the A-side of the single itself contains a picture of the moon.